A clean gutter is important to a dry basement and to ensure no water damage is happening to your home. Gutters are important to carry water away from the home and its foundation. A clogged up gutter system means the water is bypassing the gutter and falling straight to the ground like the gutter was not even there. This will lead to pooling along your foundation potentially causing water issues inside your home. Clogged gutters will also potentially result in water pooling in the gutters and coming into contact with the roof system causing it to rot and lead to repairs that will cost thousands of dollars to make your home whole again. gutters. When your gutters are full it causes water to flow over the tops like they are not even there. The water also can pool in the gutters adding weightthat the gutter system can not handle potentially backing water into the roof system causing damage to your home. 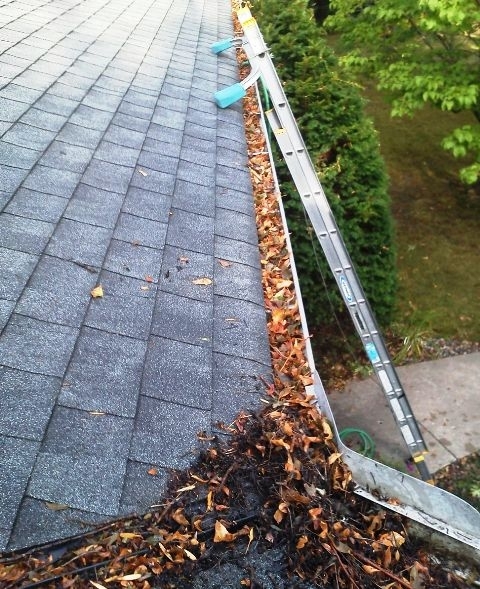 After – Your gutters are clean and so is the ground below. We bag all debris from your gutters and depending on the level of debris in the gutters we flush them out with a garden hose. We ensure all downspouts are properly flowing and report to you any issues/concerns with your gutter system. Easy repairs we will gladly handle, but we do work with professional gutter installers in the area if the job is to large. At River City Window Washing our goal is to have a completely cleaned gutter system and no signs of us being there when we are done. This means all debris will be hand scooped from your gutter system and placed into bags and removed from your property to there is no mess left behind. 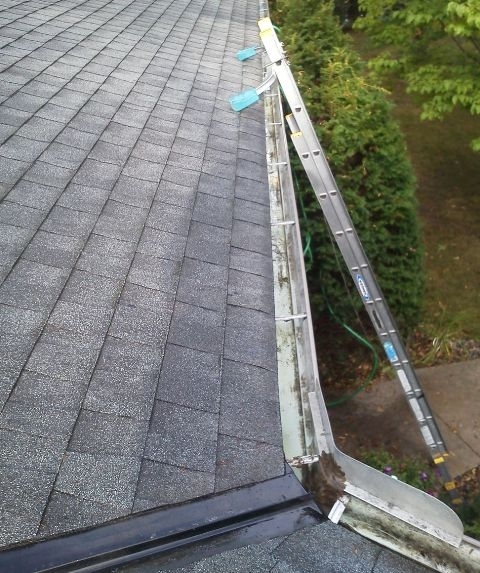 Since we do all work by hand we can ensure a complete job since we are cleaning each foot of your gutter by hand. After we are done hand cleaning your gutters we will flush your gutter system making sure all downspouts are flowing well, because face it a clean gutter is pointless if the downspout is acting like a dam. Gutter Downspout screens – We offer two different varieties of screens for your down downspouts, the most basic wire mesh costs $6 installed and the green wedges run $15 installed. These screens will allow your gutters to keep flowing even after debris has started to fill them. The hole for the downspout is very small and easily plugged by a few leaves. The gutter downspout screens make it much more difficult to become plugged as much more debris must build up making your gutter clean last longer. The cheaper wire mesh screens are a one-time use product, the green wedges are able to be cleaned and reused after each gutter cleaning on your Twin Cities home. 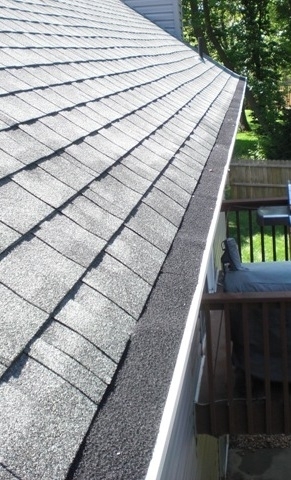 Gutter Covers – We also install a variety of products to keep your gutters clean in the future; we are more than willing to give you a free estimate when we are out pricing your gutter cleaning. 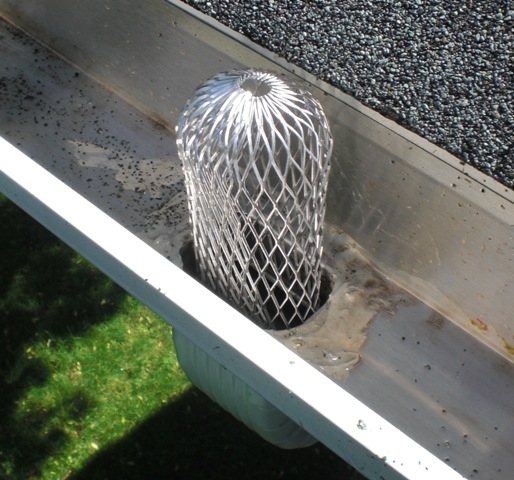 The product we recommend is a mesh product that is wedge shaped and covers the top of your gutter system allowing water to still flow underneath. The idea is any debris that falls on top will dry out and simply blow away in the wind. These covers do not 100% ensure you won’t need gutter cleaning in the future, but they will prolong the time in between getting your gutters cleaned on your Twin Cities home. The big advantage over rigid gutter helmets is they seal your gutter system and are easily removed if needed. Just ask my parents how important this is as they have rigid gutter helmets and Wasps LOVE building nests under them and you can’t access them to get rid of the nest. Installation runs roughly $6-8/foot depending on the home. Outside of gutters looking a little dirty too? We also offer cleaning of the exterior of your gutters scrubbing your gutters by hand. Since some dirt and grime is tough to budge we cannot promise you they will come spotless, but we can promise you will make you put off buying new gutters because of appearance. This work is done 100% by hand so we will be inspecting each and every foot of your gutter system to insure it is as close to perfect as possible. Have some missing or damaged downspouts? Got a few leaks in your gutters? We can handle most simple repairs to your gutter system, and when the job is simply too big to handle we work with a local gutter installer who will gladly stop by and give you an estimate to get your gutter system back to 100%. How to schedule a gutter cleaning on your Twin Cities home? The best way to contact us is on your contact page. Please fill out your full address and a phone number we can reach you at and we will schedule a free estimate for your gutter cleaning. Once you have the estimate and decide to schedule the work you simply have to contact me and I will get you on the schedule, I can typically get gutter cleanings done the same week you contact me. What do I need to do the day you clean the gutters on my Twin Cities home? The only thing I need from you is the exterior water to be turned on so I can flush your gutter system and make sure everything is flowing properly. Other than that you don’t even need to be home. Is there anything else I should do while you are out cleaning my gutters? Since during the gutter cleaning we do wash out your gutter system and water does usually spray on the windows we do offer a “quick” window clean for our gutter customers to make sure your windows are still looking good. This is not as detailed of a clean as our full window clean, but at a fraction of the price I ensure you will be happy with the value.